What a great time it was, just doing nothing except beach bumming around! I was even happily weaned from scrapping and the internet for four whole days!! oh and i used papers and elements from my own soon to be released kit - it's pending a name! And I also used ksharonk's alpha from her making mischief kit. Love, love her work! Great template-perfect for all the b-day pics I need to scrap! Thanks so much for sharing. Thanks so much for the fantastic template! Love the layout you did with it. This is an awesome template layout! I just got back from vacation with the grandkids and this will come in very handy! Thank you so much for this very nice gift! This is aewsome!! Thank you so much!! Beautiful pictures of Malaysia! 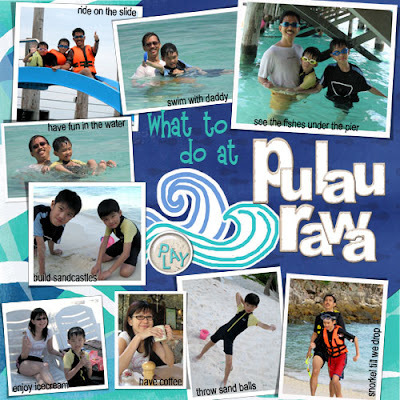 We never made it to Palau Rawa when we were there, but it looks wonderful! I just love the frame templates, and thank you. I can not find a place to email you, I would love to be able to download some of the other beautiful page templates you have here, but the links do not seem to work. Thank you for reading. It's me again. Thank you for your message to me. Very much appreciated. Thank you again for taking the time to try and get back to me. thanks this is a cool template! What a cute beach LO! Thanks for the fabulous template!